WHEN we are young, we often delude ourselves that no problem in the world will ever affect our relationship with our significant other. But once married, and raising a family, financial realities will set in and love sometimes takes a back seat. Couples start thinking of next month’s rent, the utility bill, grocery/food expenses, the kid’s tuition, medical/medicine bill, etc. Unless both of you are independently wealthy, money will be a constant cause of concern and discussion in the family. In the US financial problems are a leading cause of divorce. Although no comparative surveys are available for the Philippines, it isn’t far-fetched to think that domestic disputes do arise among couples over how family funds are spent by their spouses. One of the common issues raised by wives against their husbands is the latter’s apparent lack of awareness over the rising prices of groceries. “Doesn’t he know that since his gas expenses rise, the prices of groceries also rise as well?” is a usual complaint I hear. And while an argument may often revolve around a certain amount spent irresponsibly by the spouse (like, “How can she spend P10,000 on shoes and a party dress? !” as one incredulous husband asked me), the underlying issue is actually about how financial priorities are being handled. Suddenly, hubby comes home with a new car to surprise his wife on their anniversary, even when the family already has two other vehicles. Which is what happened to Sheila, 43. “It would have been better if we just went on vacation instead, just the two of us. It doesn’t matter where, even if it was in Boracay, at least it would’ve been cheaper,” instead of the gas-guzzling Ford Expedition he brought home. She says her husband, Prandy, gave her a regular budget to pay for household expenses and their children’s needs, but when she went out shopping with her friend, she couldn’t buy all the things she wanted. When she talked to Prandy about it, he told her that maybe she could find friends who had husbands with the same earning capacity as he, to learn how she could live on her budget. Chiqui realized her friend, who had a foreigner husband with an expatriate’s salary, had more than enough money for her shopping sprees at 6750. She took Prandy’s advice and went out with other friends who didn’t spend as much. • Set the stage for the financial discussion by making sure both of you are in a relaxed state, and your surroundings are calm and positive. 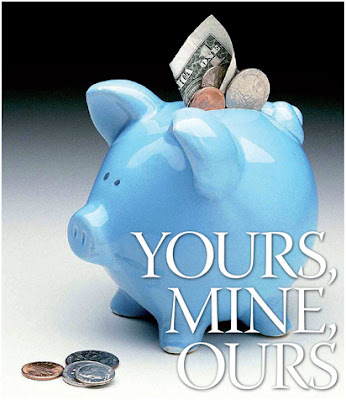 • It helps to talk about how you were raised by your parents—how much your allowance was as a child, what you bought with it, your ideas on saving, what your parents did when you asked them to buy you something. Your attitudes about money are really shaped by your family. If you had parents who splurged on you, you will likely do the same to your own kids. If your husband was brought up to be thrifty, don’t be surprised if you two are constantly butting heads. • In discussing, say, a huge credit card debt you or your husband may have wracked up, focus on what should be done about the problem, instead of fighting about how the debt got so high in the first place. And don’t assume that your way of solving the problem is the right way. Your spouse may have a better idea, so be open about it. “There was a time we didn’t use our credit cards. That was for about three years. Prandy just told me we were spending too much. So now, we use the credit cards only for emergency purchases. If we don’t have the money to buy the item, then we don’t,” says Chiqui. • Establish common goals as early as you can. If you both want to buy a house, make sure you both understand the sacrifices that need to be made to be able to reach that goal. If you have to borrow money to build that house, talk about the monthly interest rates and how much money both of you have to set aside to make the monthly loan payments. • A joint account should be set up for the regular expenses of rent, groceries, school projects, or utility bills. Establish a separate bank account for common goals, e.g., down payment on a future house, a grand family vacation, or retirement. • There are many software programs like Quicken or Microsoft Money that will help you and your spouse organize your finances and keep track of your expenses. Talking about financial matters with your spouse doesn’t have to be World War III. It is important to keep your heads cool, although even if you do fight, it is better than not talking about the problem at all. Honesty is always the key and it is best to immediately lay all your cards on the table. Think of your marriage as a business partnership. Your common goal should be financial health and wellness, just like any company. And to that end, there are ways of sticking to a budget, keeping track of your expenditures, and cutting out the unnecessary expenses. In a survey a couple of years ago by Fair Isaac, a credit-scoring company in the United States, they asked 1,022 Americans what personal traits were most important to having a long-term relationship. Faithfulness and honesty came in first and second, and financial responsibility came in third. Fourth was sense of humor. Guess what? Sexual compatibility came last for both male and female respondents. Something to think about, right?